Our program can now load and render 3D models. In this chapter, we will add one more feature, mipmap generation. Mipmaps are widely used in games and rendering software, and Vulkan gives us complete control over how they are created. In Vulkan, each of the mip images is stored in different mip levels of a VkImage. Mip level 0 is the original image, and the mip levels after level 0 are commonly referred to as the mip chain. This calculates the number of levels in the mip chain. The max function selects the largest dimension. The log2 function calculates how many times that dimension can be divided by 2. The floor function handles cases where the largest dimension is not a power of 2. 1 is added so that the original image has a mip level. 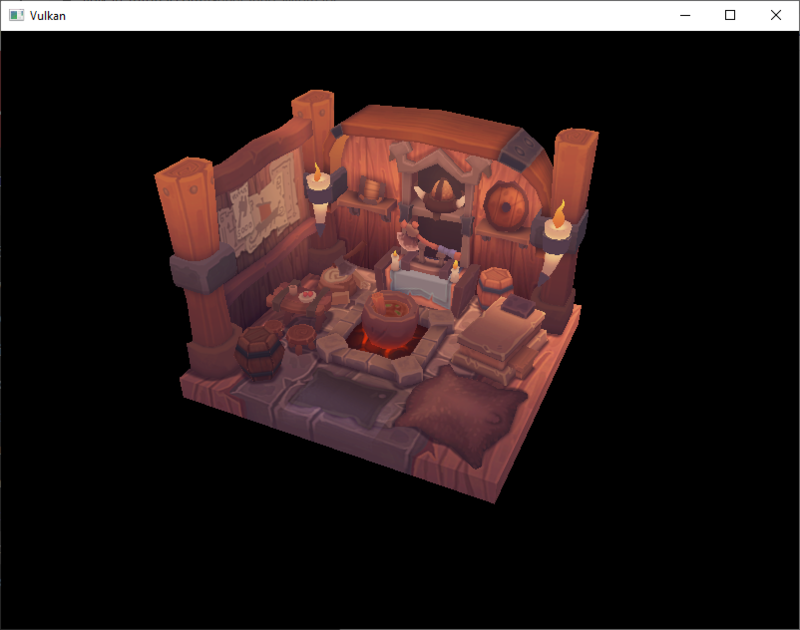 Our texture image now has multiple mip levels, but the staging buffer can only be used to fill mip level 0. The other levels are still undefined. To fill these levels we need to generate the data from the single level that we have. We will use the vkCmdBlitImage command. This command performs copying, scaling, and filtering operations. We will call this multiple times to blit data to each level of our texture image. Like other image operations, vkCmdBlitImage depends on the layout of the image it operates on. We could transition the entire image to VK_IMAGE_LAYOUT_GENERAL, but this will most likely be slow. 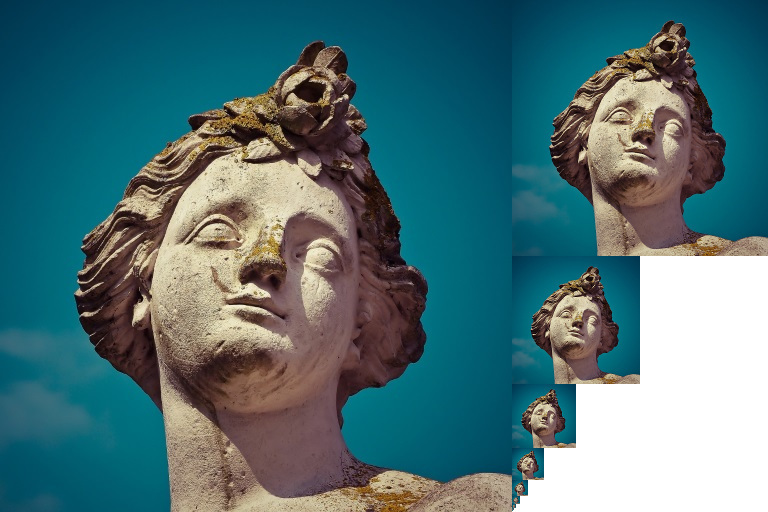 For optimal performance, the source image should be in VK_IMAGE_LAYOUT_TRANSFER_SRC_OPTIMAL and the destination image should be in VK_IMAGE_LAYOUT_TRANSFER_DST_OPTIMAL. Vulkan allows us to transition each mip level of an image independently. Each blit will only deal with two mip levels at a time, so we can transition each level into the optimal layout between blits commands. This will leave each level of the texture image in VK_IMAGE_LAYOUT_TRANSFER_DST_OPTIMAL. Each level will be transitioned to VK_IMAGE_LAYOUT_SHADER_READ_ONLY_OPTIMAL after the blit command reading from it is finished. We're going to make several transitions, so we'll reuse this VkImageMemoryBarrier. The fields set above will remain the same for all barriers. subresourceRange.miplevel, oldLayout, newLayout, srcAccessMask, and dstAccessMask will be changed for each transition. This loop will record each of the VkCmdBlitImage commands. Note that the loop variable starts at 1, not 0. First, we transition level i - 1 to VK_IMAGE_LAYOUT_TRANSFER_SRC_OPTIMAL. This transition will wait for level i - 1 to be filled, either from the previous blit command, or from vkCmdCopyBufferToImage. The current blit command will wait on this transition. Next, we specify the regions that will be used in the blit operation. The source mip level is i - 1 and the destination mip level is i. The two elements of the srcOffsets array determine the 3D region that data will be blitted from. dstOffsets determines the region that data will be blitted to. The X and Y dimensions of the dstOffsets are divided by two since each mip level is half the size of the previous level. The Z dimension of srcOffsets and dstOffsets must be 1, since a 2D image has a depth of 1. Now, we record the blit command. Note that textureImage is used for both the srcImage and dstImage parameter. This is because we're blitting between different levels of the same image. The source mip level was just transitioned to VK_IMAGE_LAYOUT_TRANSFER_SRC_OPTIMAL and the destination level is still in VK_IMAGE_LAYOUT_TRANSFER_DST_OPTIMAL from createTextureImage. The last parameter allows us to specify a VkFilter to use in the blit. We have the same filtering options here that we had when making the VkSampler. We use the VK_FILTER_LINEAR to enable interpolation. This barrier transitions mip level i - 1 to VK_IMAGE_LAYOUT_SHADER_READ_ONLY_OPTIMAL. This transition waits on the current blit command to finish. All sampling operations will wait on this transition to finish. At the end of the loop, we divide the current mip dimensions by two. We check each dimension before the division to ensure that dimension never becomes 0. This handles cases where the image is not square, since one of the mip dimensions would reach 1 before the other dimension. When this happens, that dimension should remain 1 for all remaining levels. Before we end the command buffer, we insert one more pipeline barrier. This barrier transitions the last mip level from VK_IMAGE_LAYOUT_TRANSFER_DST_OPTIMAL to VK_IMAGE_LAYOUT_SHADER_READ_ONLY_OPTIMAL. This wasn't handled by the loop, since the last mip level is never blitted from. 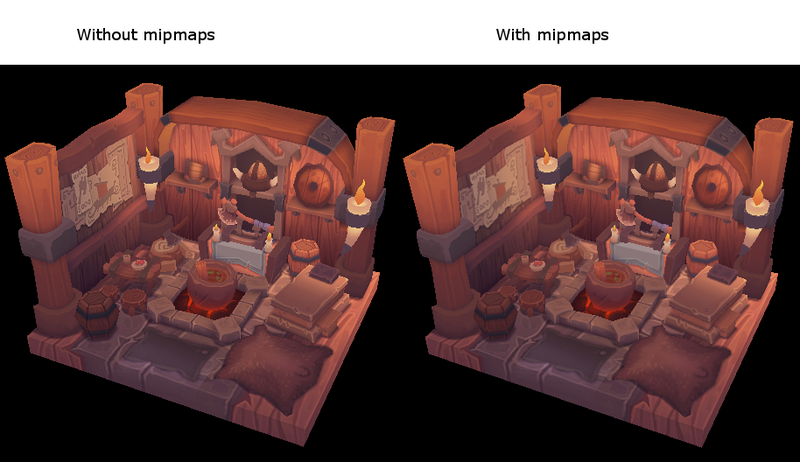 Our texture image's mipmaps are now completely filled. It is very convenient to use a built-in function like vkCmdBlitImage to generate all the mip levels, but unfortunately it is not guaranteed to be supported on all platforms. It requires the texture image format we use to support linear filtering, which can be checked with the vkGetPhysicalDeviceFormatProperties function. We will add a check to the generateMipmaps function for this. There are two alternatives in this case. You could implement a function that searches common texture image formats for one that does support linear blitting, or you could implement the mipmap generation in software with a library like stb_image_resize. Each mip level can then be loaded into the image in the same way that you loaded the original image. It should be noted that it is uncommon in practice to generate the mipmap levels at runtime anyway. Usually they are pregenerated and stored in the texture file alongside the base level to improve loading speed. Implementing resizing in software and loading multiple levels from a file is left as an exercise to the reader. If samplerInfo.mipmapMode is VK_SAMPLER_MIPMAP_MODE_NEAREST, lod selects the mip level to sample from. If the mipmap mode is VK_SAMPLER_MIPMAP_MODE_LINEAR, lod is used to select two mip levels to be sampled. Those levels are sampled and the results are linearly blended. If the object is close to the camera, magFilter is used as the filter. If the object is further from the camera, minFilter is used. Normally, lod is non-negative, and is only 0 when close the camera. mipLodBias lets us force Vulkan to use lower lod and level than it would normally use. To see the results of this chapter, we need to choose values for our textureSampler. We've already set the minFilter and magFilter to use VK_FILTER_LINEAR. We just need to choose values for minLod, maxLod, mipLodBias, and mipmapMode. To allow the full range of mip levels to be used, we set minLod to 0, and maxLod to the number of mip levels. We have no reason to change the lod value , so we set mipLodBias to 0. It's not a dramatic difference, since our scene is so simple. There are subtle differences if you look closely. The most noticeable difference is the writing on the signs. With mipmaps, the writing has been smoothed. Without mipmaps, the writing has harsh edges and gaps from Moiré artifacts. This is how higher mip levels will be used when objects are further away from the camera.